Ten days in southern Florida, the end of April and early May, in the Everglades, Big Cypress Swamp and out on the Keys, mostly birding, and capturing birds and other wildliife when possible. Mom Anhinga with Babies ~ I found this nesting Anhinga sitting quietly on her nest. I was surprised to see two baby-heads pop up next to her. Even the babies have very long necks! Baby Anhingas ~ A view of the nesting mother Anhinga with her little babies. 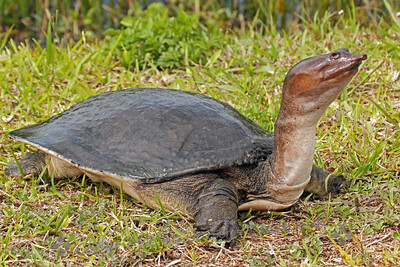 Soft-shelled Turtle ~ This very odd-looking turtle climbed out of the water and onto the bank. It was about 2 feet long and raised its head and neck like a periscope. Note its funny little snout-like nose. This appears to be a male of the species. 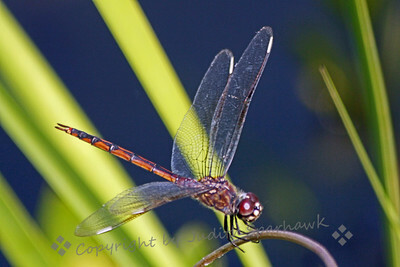 This fluttery dragonfly had a rapid wingbeat, with widely separated wings. It would light briefly on grasses, allowing only very brief views and pictures. 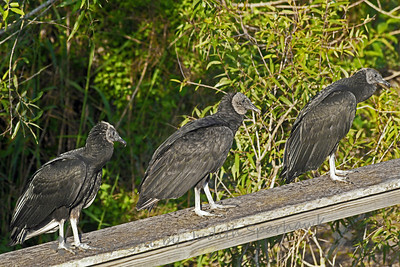 3 Black Vultures Sitting on a Rail ~ I can almost hear this as a childhood jingle, but this was a real-life scene in the Everglades. I couldn't resist capturing the moment. 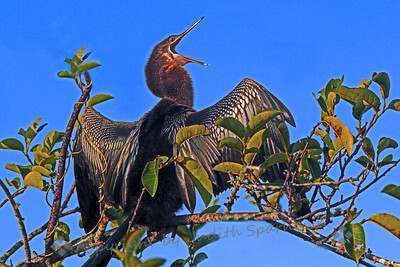 ~ This Anhinga looked like he was either singing opera, or maybe just yawning. At any rate, I thought it was a funny look. 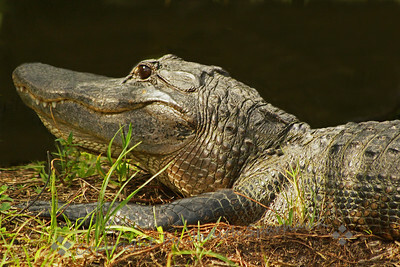 This photograph was taken on the Anhinga Trail at Royal Palms in the Everglades. 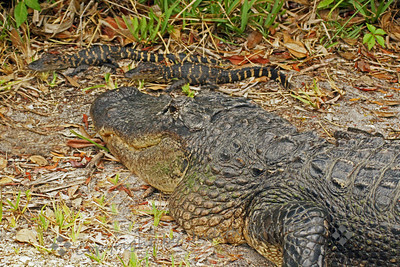 Minding the Kids ~ This Mom alligator was sunning along the trail in a State Park. She was watching "the kids", so none of us approached too close. This shot shows two of the four young. 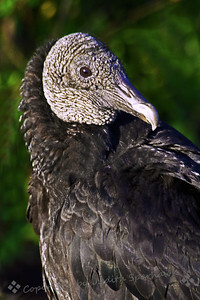 Black Vulture Close-up ~Everywhere we went in southern Florida, there were lots of vultures, both Turkey and Black Vultures. 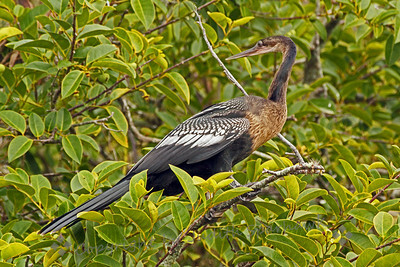 Anhinga Along the Trail ~ This view of an Anhinga shows how long and thin its neck and head are, and check out that long tail. 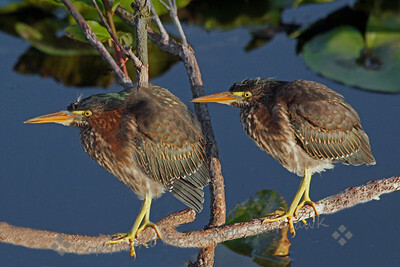 Baby Green Herons ~ These were two of four young herons hanging out along the Anhinga Trail at Royal Palms in the Everglades. You can still see a few white wisps of baby fuzz showing through their "grown-up" plumage. 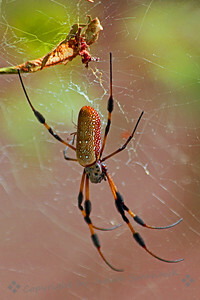 Spider Overhead ~ This spider was along the trail in a botanical garden. It was silhouetted against the blue sky, showing its interesting shape. I liked capturing the small spider as well. 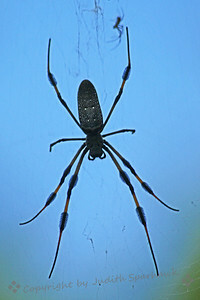 ~ While walking and birding in a botanical garden on Key Largo, I saw this interesting looking spider overhead on the trail. My insect field guide gives short shrift to spiders (since they aren't really insects, I guess), so don't have a clue what it is. 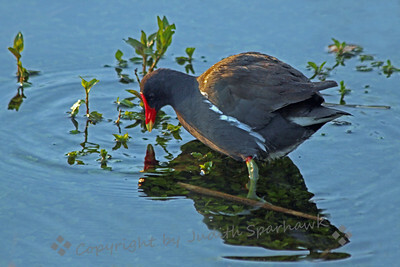 Common Gallinule ~ This gallinule was photographed on the Anhinga Trail in the Everglades. I liked the way his reflection reveals the plant life under the water. Female Four-spotted Penant ~ After working in Paulson, I believe this is a female Four-spotted Penant. 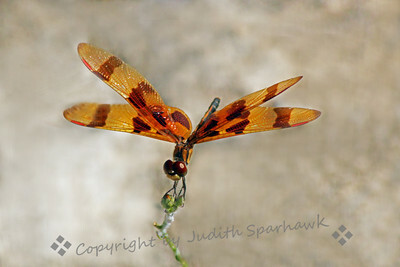 This pretty dragonfly was flitting and lighting at the edge of a lake in the Everglades. 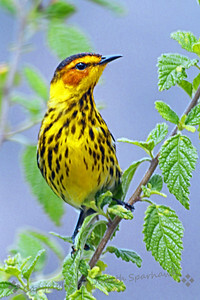 Cape May Warbler ~ I love these beautiful little birds. They were migrating through the Keys while I visited there. 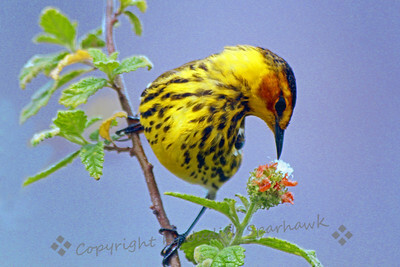 Cape May Warbler ~ This beautiful warbler was feeding at Ft. Zachary Taylor State Park on Key West. He let me get several shots of him at close range. 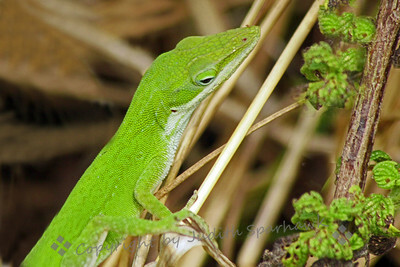 Green Lizard Portrait ~ I loved the bright color and the texture of this lizard's skin. It was photographed on Key Largo. This shows best at larger sizes. 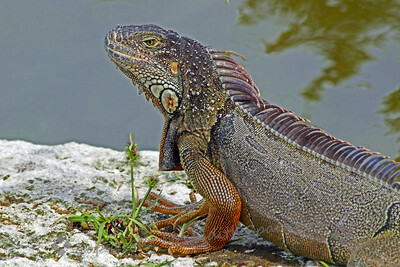 ~ This pretty iguana was overlooking a small lake in a botanical garden on Key West. 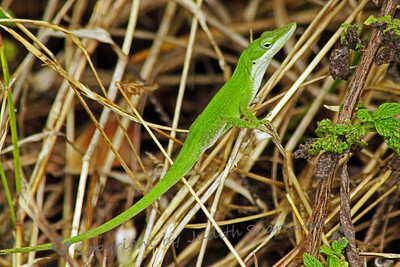 Green Lizard ~ This bright green lizard was at the side of a path on Key Largo. He was very fast, but did allow two shots before he disappeared. 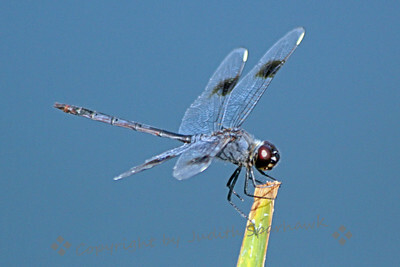 Four Spotted Penant ~ I'm not familiar with Florida dragonflies, but after combing through Paulson, I believe it is a male Four Spotted Penant. It was flitting along the edge of a lake in the Everglades. 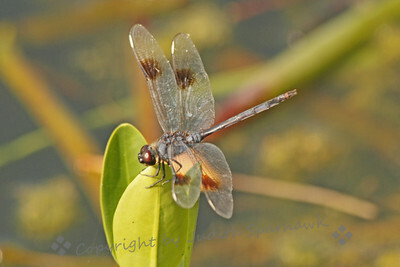 Four Spotted Penant ~ Another dragonfly view on the side of a lake in the Everglades.